Just a quick sketch for this week's Illustration Friday theme, "popularity. " I think this requires no further explanation! I honestly laughed out loud when I saw this. Awesome take on the concept. Great idea and a very nice sketch! Roland, I agree that that is not the way I would ever like to be popular. But for dogs... Although with my pug I think she prefers to be the sniffer than the sniffee. Yes, I do wonder about this when my two dogs go through this ritual every morning. Very funny take on the word of the week! Even Madison Avenue Mad Men have NO certain idea what will guarantee popularity! Nice take on the topic. OH gosh, this is absolutely perfect. Great one!! Ha ha! 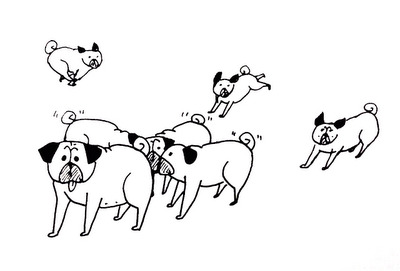 I love the ones running to join in a crowd, and their waggly tails!